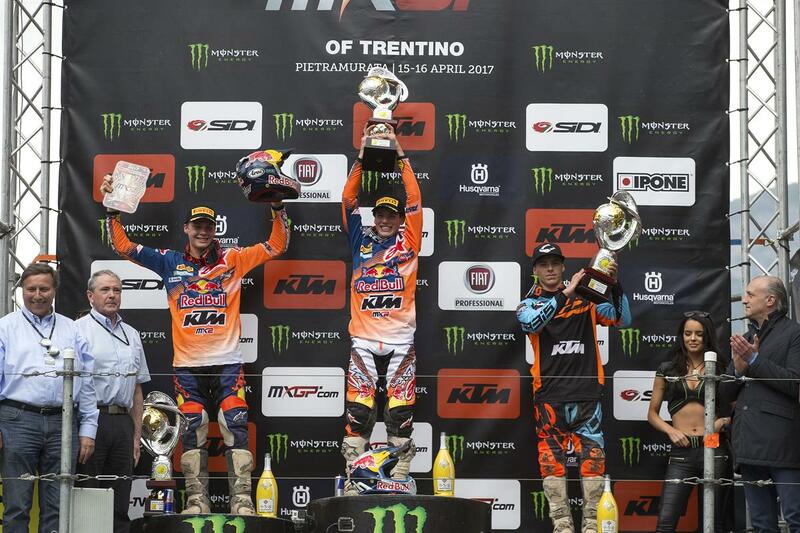 Thrilling second MXGP victory of 2017 for Red Bull KTM Factory Racing’s Tony Cairoli while Jorge Prado celebrates his first career success in the MX2 class and Pauls Jonass seizes the red plate. 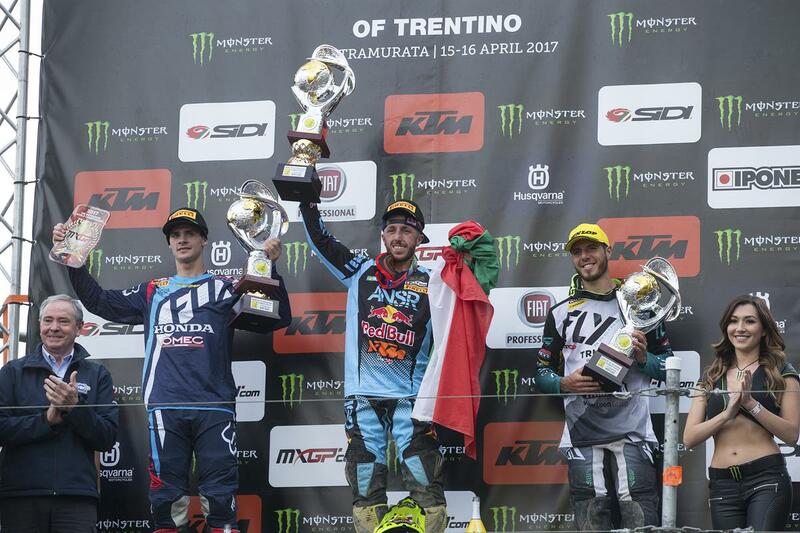 The fifth round of nineteen in the 2017 FIM Motocross World Championship delivered stunning scenes at a packed Pietramurata circuit near Arco di Trento in the picturesque climes of northern Italy and close to Lake Garda. 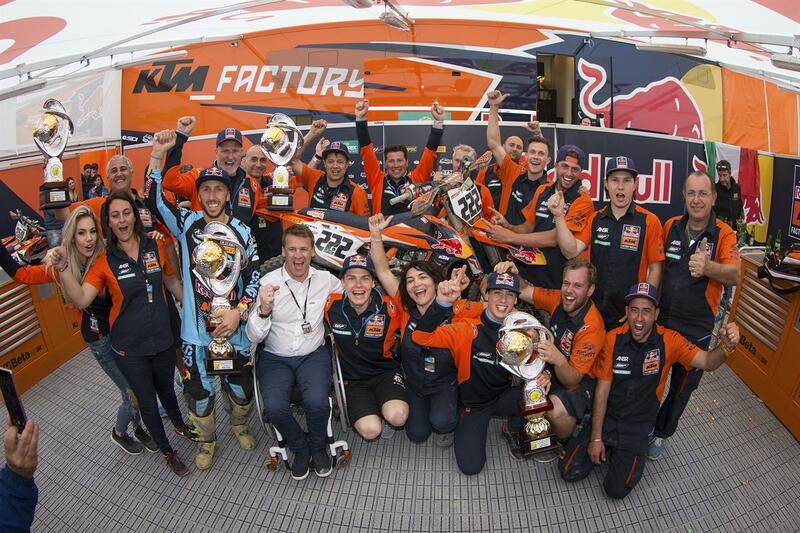 Red Bull KTM Factory Racing’s Tony Cairoli satisfied the clamour from most of the 29,500 crowd by riding to results of 1st and 2nd despite a first corner stall in the second moto that left the Sicilian down in 22nd place. 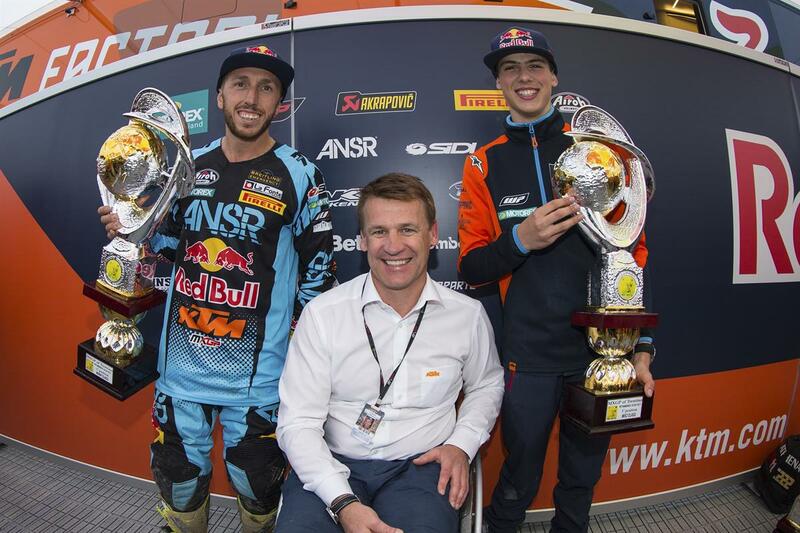 Jorge Prado won a ‘battle of teammates’ in MX2 with for his very first career success in what was just his eighth Grand Prix, but the Latvian rose to the top of the standings for the second time in 2017 after grasp the red plate with his runner-up finish. 31 year old Cairoli set out his intentions from Saturday by claiming the holeshot in the Qualification Heat race and riding free to his maiden Pole Position of the year; permitting first pick of slots in the metallic-floored gate and for the slightly uphill drag into the tight first and second turns. On Sunday Cairoli gunned the KTM 450 SX-F to the holeshot and although he had Tim Gajser and Arnaud Tonus for company for the rest of the moto he remained ahead of the pack for his third race win of ’17. 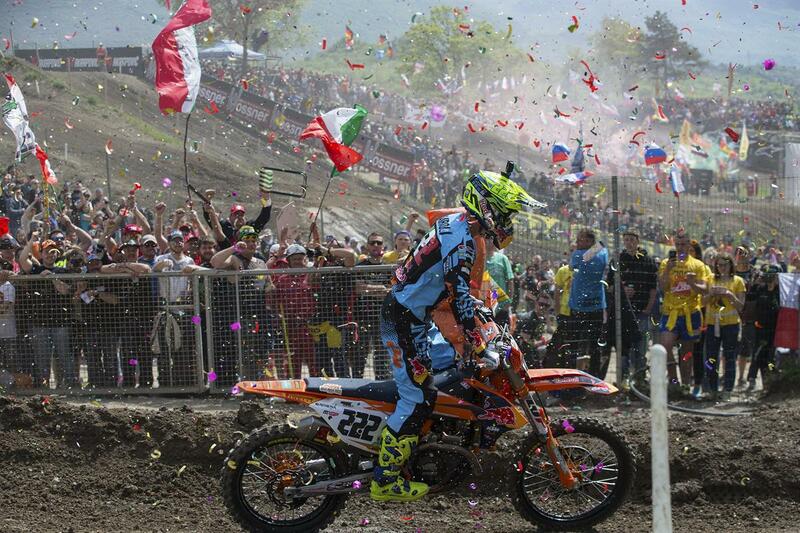 The second moto start was dramatic. #222 fell and was clipped by a large section of the pack. He remounted towards the rear of the field and on a tight, slippery and difficult track for overtaking his chances of victory had all but gone. The former six times world champion then produced a performance for the ages to trawl through to second position – using a lefthander from a step-up jump to remarkable effect and gaining five positions on five different laps from the manoeuvre alone – and sent the spectators (and his team) crazy. The reception for Tony and his 79th Grand Prix success was emotional and ecstatic from the vast flock of public that rushed the start straight for a view of the final podium. 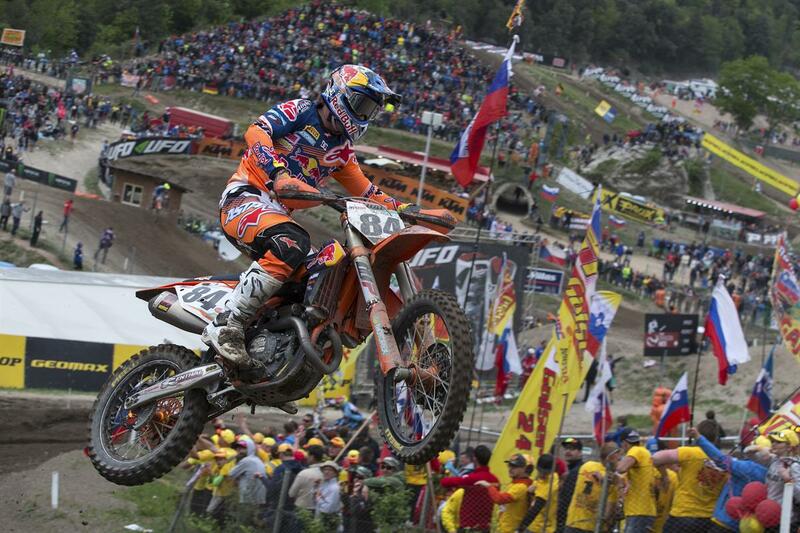 Jeffrey Herlings was riding at the scene of past success in the MX2 division and made his bow on the around the Arco ruts and bumps. The Dutchman was fourteenth and struggled in the first outing but finally nailed a good start to slot into the top four in the second moto and gained his best finish in MXGP to-date with fourth place by the flag for eighth overall. Glenn Coldenhoff, who had recovered from his tweaked shoulder after a hefty crash in the Grand Prix of Mexico two weeks previously, started the first moto badly and circulated with Herlings; eventually taking seventeenth spot. #259 stuck with his countryman around the opening turns of the second sprint and completed the race with tenth and fourteenth in the Grand Prix classification. As per usual this season sixteen year old Jorge Prado was in direct contention for the holeshot in both motos in the MX2 class on his KTM 250 SX-F. The Spaniard was just pipped by Jonass in the first race and the two teammates set the pace at the front of a static moto with LRT KTM’s Julien Lieber following in third place. Jonass claimed his fifth chequered flag of the year while Prado bagged his third top three result. The second moto again saw the starting superiority of the SX-F come to the fore; once more #61 and #41 spearheaded the pack into the tight first turns. Prado forged an early advantage as Jonass – who had been searching for speed and comfort on Saturday – chose not to take too many risks. 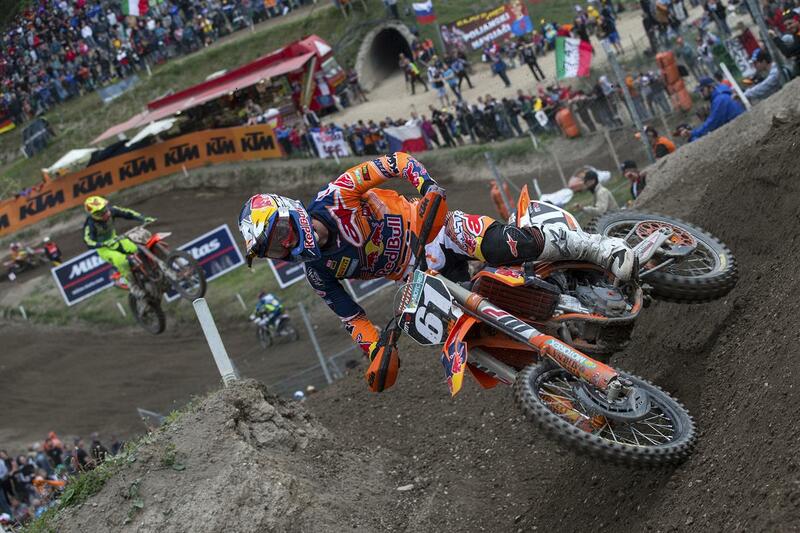 Through the backmarkers the distance between the pair narrowed and the Red Bull KTM team witnessed a tense match-off. 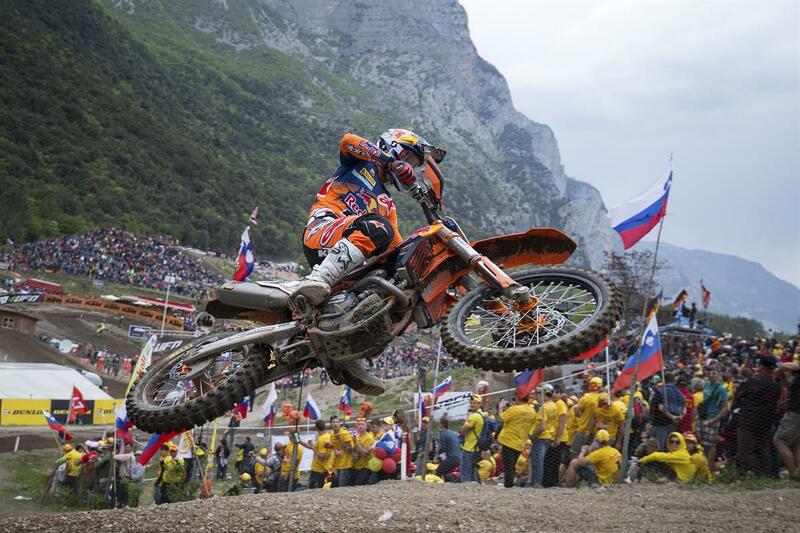 Prado eventually held strong to capture the chequered flag and the first GP win for Spain since 2009 and the first ever in MX2; accomplished in the teenager’s eighth Grand Prix. With second position Jonass is now the leader of the MX2 table by 9 points over Jeremy Seewer. MXGP barely pauses now with round six of the series taking place this coming weekend at the Eurocircuit, Valkenswaard in the Netherlands for the Grand Prix of Europe. 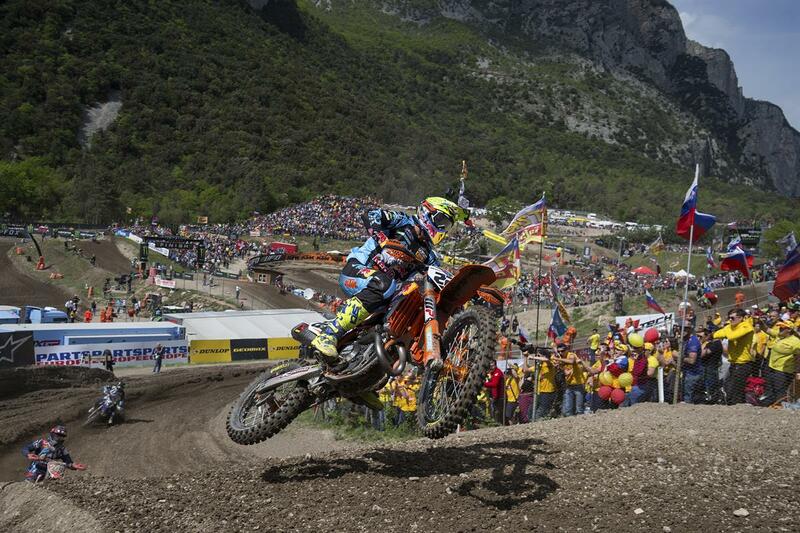 This entry was posted in Global News, Highlights, Moto, Motocross, Motorsports, Offroad by admin. Bookmark the permalink.